We live in an exciting time for life coaching. 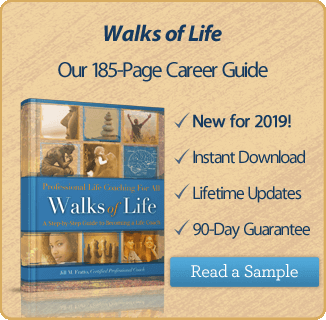 As multiple generations span the workforce and society offers challenges and opportunities like never before, the field of coaching is ripe with potential as people from all walks of life have begun to appreciate and hire life coaches to help them overcome obstacles that may stand in their way. Life coaching conforms to you and your vision for the business you want to build. Choose a specialty, find your audience and let the clients roll in. You can even coach clients from all over the world from the comfort of your home office as most life coaches meet with their clients by phone. By this point, you’ve probably done your research about life coaching and know that you want to get certified. You also know how important coaching certification is for your reputation and overall business success. Now, it’s time to choose a life coach training program that meets your needs for training. Flexibility: Is the program designed to be flexible and cater to a busy student already working inside or outside the home? Learning Mode: Can all or part of the program be completed through distance learning? In my experience, this is very important to people seeking coach training. Range of Offerings and Support: Does the program offer a variety of courses and support for students both during and after training? New coaches need and want support for their business after they receive their certification. Cost: Are the costs associated with the program reasonable and easy to understand, without hidden costs or confusing fees? Reputation: Does the school have a good reputation and representation in the coaching community? So which schools fared best? The following three schools met all of the criteria above and are accredited through the International Coach Federation. There are many more worth mentioning, but this will get you started in your research. 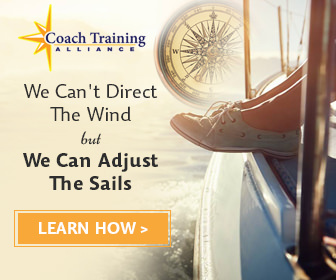 Due to its unique emphasis on business and marketing and comprehensive Coach Training Accelerator program, we recommend Coach Training Alliance more than any other program for any aspiring coach looking to start their own practice. This rigorous program combines live teleconferencing, interactive software, and various online resources to turn students into coaches in 6 months. Coach the Coach: CTA believes that the most effective way to learn is not only through study, but through practice. Throughout the 6-month program you will coach and be coached by other members of your program, as well as gain firsthand experience observing professional coaches practice their craft. A maximum of 12 participants per class. Research has shown time and again that 10 to 15 students is the sweet spot in striking the balance between group synergy and individual attention. Comprehensive coach-specific business training. This is what truly set CTA apart from most other programs. In addition to adhering to the rigorous academic standards set by the ICF, Coach Training Alliance recognizes that business acumen is just as important as academics when starting a coaching practice. From attracting clients to building a website, CTA covers the entire process of starting a coaching practice. This allows students to graduate from their program not only informed, but also confident in their ability to turn their passion into profit. The program costs $3147, which makes CTA one of the most affordable programs available, especially if you avail of their 9 month payment plan. iPEC stands out among coach training programs for its successful track record in the industry and powerful training process and philosophy. iPEC is headquartered in New Jersey, but it’s training locations include the US, UK and Canada. Fourteen of its sixteen training location are in the US with courses in most metro areas. Further, much of the program is completed online and by phone. Three modules, each three days long, are completed face to face at the physical training locations. This allows for both ease and flexibility for participants, but also facilitates personal integration with peers and coach trainers. iPEC offers an experiential approach to training that is largely based on the work of founder Bruce D Schneider, MCC and PhD. iPECs proprietary methods include the Core Energy Dynamics™ and the Core Energy Coaching™ processes, both created by Schneider. Specialties for coach trainees at iPEC include life, business, career and executive coaching and include a range of subspecialties in each category. iPEC is not new to the ICF either. The program has been fully accredited since 2002. Upon completion of the program, participants are Certified Professional Coaches, accredited and fully recognized by the ICF. The all-inclusive cost of the program at this writing is $9895. This includes all instruction, mentor coaching and materials. Students pay separately for lodging, travel, food and any office or long distance calls incurred for training. Tuitions specials are offered regularly so make sure to check to see what is being offered when you are doing your research. Coaches Training Institute (CTI) is one of the most well-known training programs in the industry. This is due in part to their long standing program, in existence for more than twenty years. The program has trained over 35,000 coaches since it began. CTI founders were largely responsible for the creation of the ICF and assisted with the creation of the ICF ethics and competencies. Consequently, CTI was the first coach training school to receive certification from the ICF. Founders of the CTI program also wrote Co-Active Coaching, used widely by coaches and even other coach training programs. Training locations include Canada, Singapore and thirteen US locations (major metro areas). The program teaches their proprietary Co-Active Model, built on the foundation that clients possess the ability to know what is best for them. The coach’s role is to come from a place of authenticity, encouragement and deep listening to help elevate the client to their highest natural state. CTI Trainers are leading coaches in the field, devoted to promoting a standardized profession for coaching. CTI’s training approach includes comprehensive, in person training, professional practicum for certification, business and marketing support and skill development and an ongoing community of support for coaches after graduation. CTI’s program is organized in five in-person courses followed by a certification program. The five courses are each held face to face on week-ends (Friday-Sunday). After the courses are complete and the student has five paying clients, they enroll in the certification program, which includes one-on-one supervision with a coach to deepen and refine coaching skills. The certification process takes six months and is done completely by phone. After both components are complete, students take a written and oral exam to receive their certification. The entire process takes approximately one year and costs approximately $10,000-12,000 depending on how the program is completed (courses may be purchased a la carte and cost more when taken that way). Visit their website or call for specific pricing information. Of course there are many coach training programs that are worthy of praise. These three programs stand out based on the factors that I described, but there are many programs that deserve recognition. This short list will get you started and help you understand what to look for in a reputable training program. Thanks to the International Coach Federation, you can search for accredited programs by many different criteria on their website. Every prospective coach is different in their needs. Make sure you do your due diligence and get all your questions answered before you commit to a coach training program. You want to make sure that it fits not only your needs for learning, but also your personal style and philosophy. Coaching is a great investment, both personally and professionally. You want to feel confident knowing you are getting the most for your time and money.